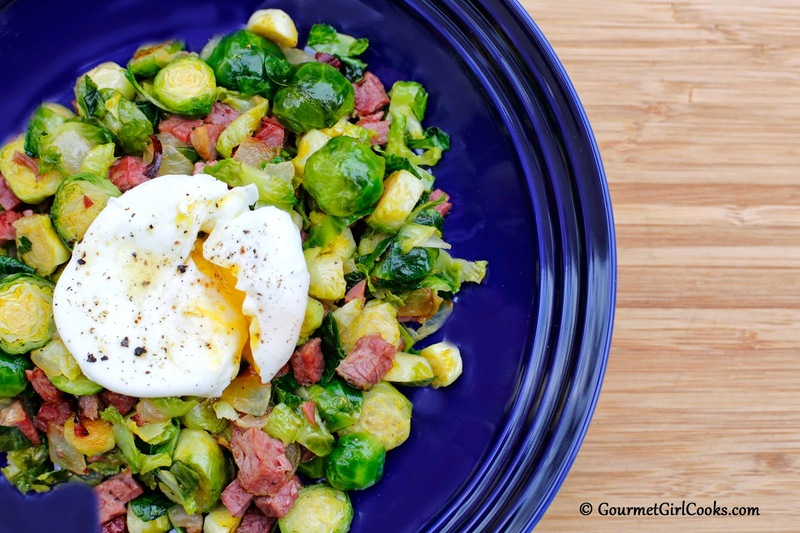 This evening I made a quick, delicious and easy meal using some of the leftover corned beef brisket from last night's meal to make Corned Beef Brussels Sprouts Hash topped with perfectly poached eggs. It was so easy to make. I diced up about 1 cup of the leftover beef and trimmed and sliced about 1 pound of fresh brussels sprouts. I also diced about 1/4 of a medium onion. I began by sauteing and caramelizing the onion in a tablespoon of coconut oil in my nonstick wok. 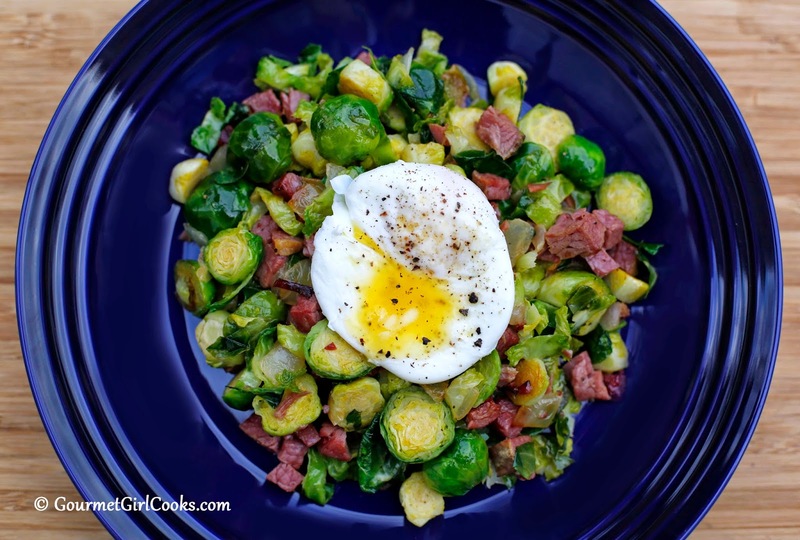 When it became translucent and began turning golden, I tossed in the diced corned beef and lightly browned that a bit and then added in the sliced brussels sprouts. I tossed them around until they began to wilt and soften and then added in 1 to 2 tablespoons of Kerrygold butter and continued sauteing them until they were tender-crisp. While the sprouts were cooking, I brought some water almost to a boil in a 2-quart saucepan and then added in a splash of white vinegar and stirred it in. As the water was swirling in a circular fashion, I added in a couple of cracked eggs one at a time, pouring them in from custard cups so I could control how quickly they slipped into the swirling hot water. I cooked them at barely a simmer for about 4-1/2 to 5 minutes and then removed them with a slotted spoon and placed them on a paper towel lined plate. I placed a bed of the hash in a shallow bowl and then topped it with a poached egg and a pat of Kerrygold butter (notice in the 2nd photo how beautiful, bright and yellow the Kerrygold butter is; the yellow in that photo isn't the yolk, it's the butter). The meal turned out delicious. I snapped a couple of photos below. Enjoy!